Well, that's in the article too, and the numbers have been going up since 2007. 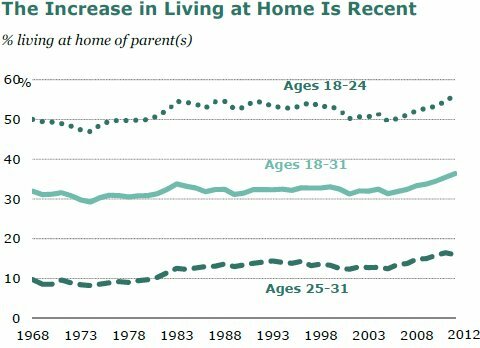 16% of 25 - 31 year olds live with their parents (2012 data). I moved out at age 22. Though I love my parents, I love my own personal space. When my husband and i was transitioning jobs/locations we moved back in. Both financially stable but wanted to take our time moving back. They never charged us rent or anything which helped us save even more. Very grateful. However, I couldnt stay forever. Being married, its not even an option haha. My husband's uncle moved back home to his parents after a divorce and never left. He is in his 60s now. I suppose if your alone especially it may be beneficial to, but being single/planning to have family one day or needing independence at all it wouldnt work forever. Not to me anyways. Mooching isn't good, but I think the whole narrative of parents and kids dying to get away from each other is a little overblown. My family wasn't like that on either side and I hope things aren't like that with my own kids. I think the media strings this along by portraying living at home as automatically meaning loser and parents as surely being miserable. Plenty of parents don't see having their grown kids at home (at any age) as mooching. If the parents are in extreme poverty it may be a burden, but if the parents are somewhat financially comfy, having a an extra person at home isn't that big of a deal...cooking a little extra at meal time and the power/water bill goes up a tad. If their child has no income and doesn't go to school - that may be unhealthy, but otherwise, if everyone is happy being together I don't see the big deal. I have an aunt that never married or moved out, but she's always worked. As my grandparents got into their 70s and 80s, it was extremely helpful having her at their house. She could help them with stuff around the house, reading labels, cleaning dishes, grocery shopping, doctor appointments and they just generally gave each other companionship. Neither party ever had any complaints. The only bad thing is when my grandparents passed away within 6 months of each other - it hit her EXTREMELY hard. Luckily, she has 3 siblings, aunts, cousins and nephews/nieces to spend time with. Mooching isn't good, but I think the whole narrative of parents and kids dying to get away from each other is a little overblown. My family wasn't like that on either side and I hope things aren't like that with my own kids. I think the media strings this along by portraying living at home as automatically meaning loser and parents as surely being miserable. I agree with this, quite frankly. I always comment on these threads because I'm 41 and live with my mother. Have for over a decade now and will continue to live with her till she dies. When people find this out, I do get the sideways glances. It's ingrained in the American culture to look down on people who live with their parents. But really, what is wrong with living with someone you enjoy the company of and share expenses and responsibilities with? Absolutely nothing, and I think plenty of adults who live with their parents have this arrangement, despite the nerdy introvert in the basement or the super-mooch like the OP is talking about caricature. Except the OP says he *doesn't* share expenses with his parents. They pay for everything except about $200 of restaurant meals. He doesn't say if he helps with chores. I wonder if that's really an issue if the parents can afford it? Maybe they simply enjoy having their family close and sharing their wealth with the kid(s)? It's not merely a question of money. It's a question of what it means to be a self-respecting adult rather than a charming kid. It is also about being able to handle adult responsibilities. How to buy/pay for a car. How to pay bills, budget, plan meals and prepare them. Independent living skills and experiences. Things that it sounds like this poster is not experiencing. Last edited by Gabbythecat; 01-03-2016 at 09:28 PM..